Here is a piece that Pat Jordan wrote for the New York Times back in 1989. It is reprinted here with permission from the author. At the Yankees’ spring training clubhouse in Fort Lauderdale, Fla., Rickey Henderson tells reporters Yankee pitchers drink too much. Dave Righetti tells reporters Henderson should mind his own business. Don Mattingly tells reporters he thinks maybe Henderson has a point. Dave Winfield, seated at his locker, watches with a big mischevious grin as schools of reporters swim back and forth from Henderson’s locker to Righetti’s locker like tiny fish being led blindly by the pilot fish of dissension. A few days later, at the Mets’ training camp in Port St. Lucie, Fla., Darryl Strawberry threatens to walk out of camp if the Mets don’t renegotiate his contract. He sulks on the field during photo day. Keith Hernandez tells him he’s acting like a baby. Strawberry takes a swing at Hernandez while cameras click. They scuffle and are finally pulled apart by teammates. Back at the Yankee camp, Winfield, laughing now, says that the Mets have outfoxed the Yankees and now it’s the Yankees’ turn to find some way to get attention back on them. His teammates laugh. Reporters, however, take the two disturbances seriously. They wonder, in print and on television, if dissension is ripping apart what they perceive as the delicately stitched fabric of clubhouse harmony each team must weave if it is to be successful? They see it all so clearly from their perspective, as men and women who have never been part of such clubhouses. They have always imparted to clubhouse harmony a certain romance of brotherhood they would only laugh at if someone tried to impart it, say, to the boardroom of I.B.M. They see relationships among players in a baseball clubhouse as merely an extension of the child-play relationships they remember from their youth. Many a sublimely contented baseball team has finished out its season dead last, while more than a few angry, squabbling teams have gone on to win their league titles and the World Series. 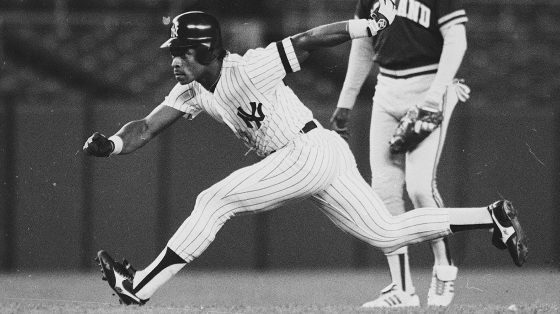 The Oakland A’s of the Reggie Jackson-Sal Bando era, and the Yankees of the Reggie Jackson-Thurmon Munson era are perfect examples of the latter. Jackson and Munson may not have shared too many intimacies in the clubhouse before a game, but that certainly never affected their play on the field. Which is the point. The only thing that matters to players is the game. It unites 25 grown in spite of the fact that they all come from diverse backgrounds and may not have much in common. The game is what gives players great tolerance for their teammates’ foolishness in the clubhouse. (”Oh, Rickey. He’s just being Rickey.”) They can accommodate themselves to Rickey being Rickey or Darryl being Darryl in the clubhouse as long as Rickey is Rickey and Darryl is Darryl once they step across those white lines. Then, everything is forgotten, fades from memory, becomes trivial. Like most men in business, baseball players compartmentalize their jobs. What goes on across the white lines is infinitely more important than what goes on behind them. A close friend who consistently strikes out with the bases loaded isn’t as much use to a ballplayer as a despised teammate who consistently strokes game-winning hits. The respect a player feels for a teammate’s personal life has nothing to do with the respect he feels for a teammate’s baseball talent. Babe Ruth, Pete Rose and Wade Boggs are three of the greatest hitters ever in the game, and yet not many teammates might envy their personal lives. Yet to a man, every player in the game would want one of those three at the plate if a World Series championship was on the line. Dissension then, although it may exist in the clubhouse, doesn’t much affect the game beyond it. That possibility is a creation of the news media, which mistakingly judges the game by the same standards it judges other jobs in ”the real world,” a phrase ballplayers use. In the real world, workers work in their clubhouse or office. The mood of their workplace does affect their jobs. A writer can’t write in a hateful environment any more than a salesman can sell his wares in one. In the real world, a worker can sabotage a despised co-worker, and get away with it, because it generally won’t affect his job in a negative way. Often, it affects his job positively. He leapfrogs above his sabotaged co-worker. But baseball players work before a vast, all-seeing audience, not in the private confines of their clubhouse. If Henderson were to drop a fly ball deliberately to show up Righetti on the mound, it would be he, Henderson, who would be heaped with ridicule by the fans. Ballplayers’ egos are too big for them to expose themselves to such abuse. Therein lies the beauty of the game. It appeals to both an individual’s ego and his sense of team play. Baseball isn’t like other team sports where the play of the individual and the team are often blurred. A running back in football can’t show much without the help of his linemen anymore than a basketball player can score points without sharp picks and passes from his teammates. Dissension in those sports can spill over onto the court and field and affect team play. Basketball players can freeze out a despised teammate, just as a football quarterback can freeze out a wide receiver. In baseball, an individual’s play is distinct from the team’s success even though it contributes or detracts from it. Every player does his own solo dance before the fans. The shortstop, gliding into the hole like a skater on ice, backhands a sure hit, straightens himself, and throws the runner out to thunderous applause. His individual play is rewarded at the same time that his team is rewarded with an out. That’s the beauty of baseball. It’s the only team sport where an individual’s accomplishments or failures are first chalked up to him, personally, and only then added or subtracted from the team’s success or failure in a peripheral way. And always the team’s success or failure is greater than the sum of it’s individuals’ contributions. In the late 50’s and early 60’s, I played minor league baseball throughout this country. I spent four years in baseball clubhouses with players who cheated their teammates in cards, who seduced their teammates’ wives, who were drunks or bigots or just plain mean, and I can’t remember one time when any of those players’ characteristics affected the play of their team on the field. In fact, I remember one time most clearly of all when I had a fistfight with a teammate who was most closely tied to my success or failure as a pitcher. The player was Elrod Hendricks, now a coach with the Baltimore Orioles. Then, in 1959, we were playing for the McCook Braves in McCook, Neb. Elrod and I squared off on the sidewalk on Main Street one sunny afternoon in July. It was a brief fight. I lowered my head and charged Elrod like a bull. He grabbed me around the neck and began punching me in the stomach until I lost my wind and collapsed to the sidewalk. I sat there, ridiculously, legs spread like a child, gasping for breath. That night, all of our teammates knew about the fight, as did our manager, who fined us both $25. When I took the mound in only my third professional game Elrod was my catcher. He called a beautiful game. He threw out two runners trying to steal second base and he tagged out the potential tying run in the eighth inning in a play at the plate. The runner slammed into Elrod with his shoulder and they both went tumbling in the dust. But Elrod held onto the ball, despite being spiked in the shin, drawing blood. In the ninth inning, I struck out the last batter of the game with a nice curveball to record my first professional shutout. Elrod caught that third strike and leaped out of his crouch, grinning. He ran to the mound and threw his arms around me and hugged me. Rickey was being Rickey before Manny was out of diapers. Oh man, that was nice!